Called “a modern day Father Martin”, by Father Martin, Bob Francis is a new voice, plain and simple. His clear and friendly style promotes good-will and positive expectations. This may be just the message your clients need to hear right now. DVD: Anger Management: It’s The Same As Drivers Education! Short and direct, this video presents a tool for controlling anger “one day at a time”. In the same manner we learn to drive cars, with help and with rules, we can learn to “drive” our anger instead of letting it drive us. Part of the “Keep It Simple” Series by Bob Francis, this DVD was developed to DEAL with Anger Management in a Treatment/Community Corrections agency. This is done in Bob’s “Keep It Simple” fashion of helping an addict find a way to get better “One Day at a Time”. DVD: Triggers: How To Use Them To Strengthen Your Recovery! Just as a gun can go bang or click, depending on what’s in the chamber, Bob teaches how to associate any trigger with something positive in the “chamber” of the mind. Since triggers will always be around, this strategy will enhance recovery and help prevent relapse. 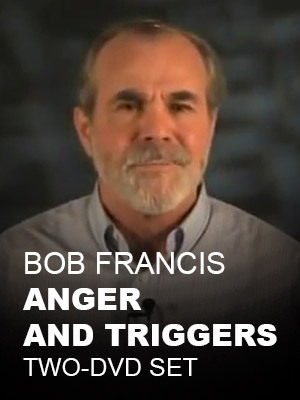 Part of the “Keep It Simple” Series by Bob Francis, this DVD was developed to address the idea of “Triggers” and how to use them to make your early recovery more positive and less chance of having to: “Re-Introduce Yourself”.